Pope Benedict XVI has appointed Fr Anthony Falah Borwah as the 3rd bishop of Gbarnga diocese. Fr Borwah was born on 3 October 1966 in Wodu, in the diocese of Gbarnga. He studied for the priesthood in Sierra Leone, Ghana and Liberia and was ordained a priest for the Archdiocese of Monrovia on 15 September 1996. He served in the following parishes after Ordination: Sacred Heart Cathedral, Monrovia (96-97); St Peter Claver, Buchanan (1997 – 1998); Further Studies, Rome (1998 – 2001); Christ the King, Monrovia (2001 – 2005); St Anthony’s, Gardnersville (2005 – 2009). Since 2009 until hs appointment today, Fr Borwah has been the Administrator of the Sacred Heart Cathedral, Monrovia. The bishop-elect succeeds Archbishop Lewis Zeigler (pictured left) who was appointed Coadjutor Archbishop of Monrovia on 11 July 2009. He was appointed the Archbishop of Monrovia on 12 February 2011, succeeding the Most Rev Michael K Francis who had reached the age limit laid down in Canon 401,1. Since July 2009 the diocese has been cared for by an Apostolic Administrator, Fr Chris Brennan SMA. He made the announcement of the appointment at St Martin’s Cathedral, Gbarnga at midday on 21 March 2010. Fr Brennan, who hails from Kiltimagh. Co Mayo, has served in Liberia since his ordination in 1988. Gbarnga diocese was erected on 17 November 1986 with territory taken from the Archdiocese of Monrovia. Its first bishop, Rt Rev Benedict Dotu Sekey, died suddenly on 13 December 2000. 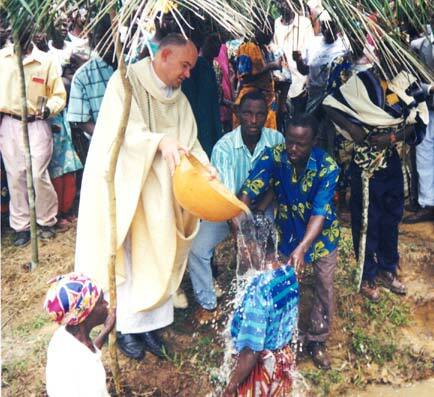 He was succeeded by Rt Rev Lewis Zeigler who was ordained bishop in Gbarnga on 9 November 2002. The diocese covers 34,000 sq kms. With his appointment to Monrovia the diocese was without a bishop until today’s announcement. The first independent ecclesiastical jurisdiction in Liberia was the Prefecture Apostolic of Liberia, erected from the Vicariate Apostolic of Sierra Leone. The first Vicar Apostolic of Sierra Leone was the SMA Founder, Bishop Melchior de Marion Brésillac who died after less than six weeks in Africa, in Freetown, Sierra Leone on 25 June 1859. On 10 February 1906 Fr Stephen Kyne SMA was appointed as the first Prefect Apostolic of Liberia. At that time the country was considered perhaps the most difficult of the Church’s West African missions. Earlier attempts to establish a mission there by other missionary societies had failed. The mission had now been confided to the SMA and Stephen was nominated to lead the first expedition. Stephen spent four years in Liberia where, in the face of the greatest difficulties, he succeeded in firmly rooting the Church, establishing stations at Kekrou and at Kakata. Confronted with the death of colleagues, the constant companionship of illness, deprivation and isolation, the hostility of Protestant missionaries and the indifference of the population, he was to provide a superb model of missionary evangelisation for his successors. In 1910 he was recalled to Ireland to lead the new branch of the Society. In 1934 Liberia was raised to the status of a Vicariate Apostolic. In February 1950 a new Prefecture was erected from Monrovia: Cape Palmas. It became a Vicariate Apostolic in 1962. 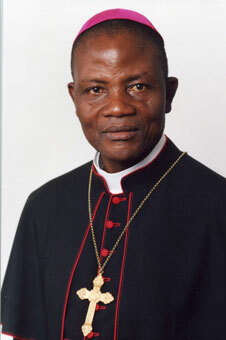 With the erection of Gbarnga in 1986 Liberia now had three ecclesiastical jurisdictions and had its own independent Catholic Bishops’ Conference.